We had a great time with a St. Patrick's Day theme this week! I finally changed out the sensory bin (though the kids were still really enjoying the Rainbow bin). I got the idea for this bin from here at No Time For Flashcards. 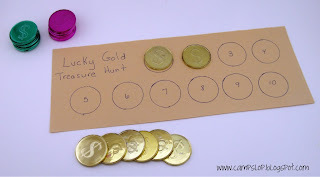 Another idea from No Time For Flashcards was a simple Treasure Hunt game. Using more of the plastic coins (I found mine at the Dollar Store) and some construction paper, I made a fun game to help Chaos with his counting and number recognition. I was VERY impressed with how good Chaos was at finding the gold! 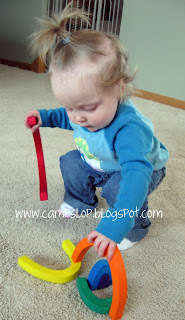 Searching through our boots for more leprechaun gold! What's St. Patrick's Day without a rainbow? This week we tried the Catch a Rainbow Science Experiment from Kidzone. I introduced the kids to primary colors and we talked about what colors they made when mixed. 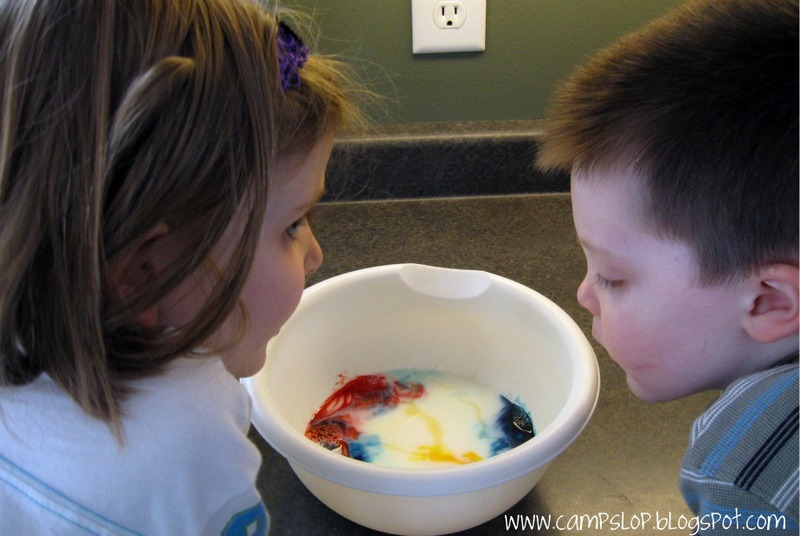 They had fun watching for a bit, then Pinky asked if she could blow on the colors to make them move faster. It turned out to be a great idea. A gentle blow caused the colors to move all around, and it was as though we were painting. Very cool! We made our own pots of gold! 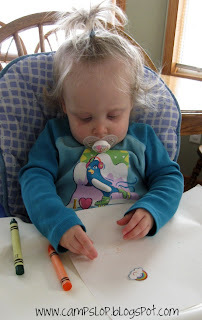 First I drew a pot on black construction paper and had the kids cut them out and glue them to a piece of white paper (Chaos needed some help, but Pinky did awesome). 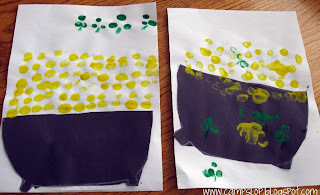 Next we painted coins and shamrocks using our fingers! The gold coins are thumbprints and the shamrocks are (mostly) pointer fingers. The kids thought this painting was hilarious and loved making their leprechauns "rich" with gold! Finished pictures. I wanted to take some in process pictures but the painting got messy quickly! Don't worry, we didn't forget about Wild One this week! 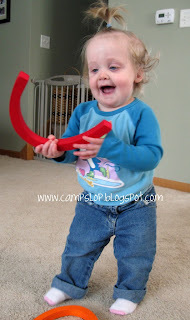 She had her fair share of rainbow inspired fun! 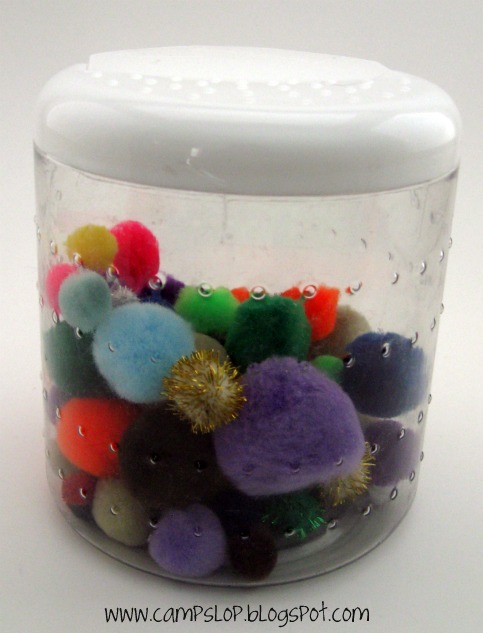 First I put together a rainbow pom shaker like the one on No Time For Flashcards. I tried desperately to get a picture of Wild One actually playing with this because she really loved it, but the second she saw the camera she giggled and ran away. Next we played with her wooden rainbow stacker. 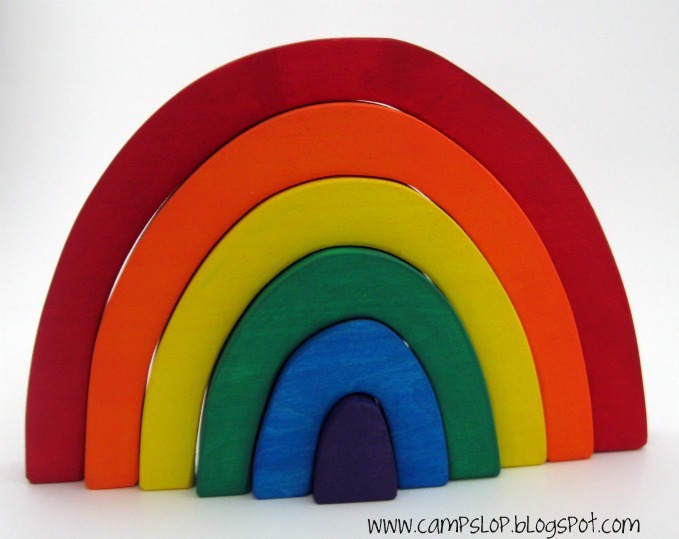 I ordered this way cool rainbow stacker from Imagination Kids on etsy. It's all wood with nontoxic paint - perfect for little ones. 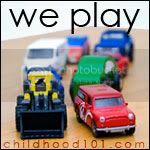 I've ordered a few toys from Imagination Kids and have been impressed with the quality and service! (And that's my non-paid, unsolicited opinion). Wild One LOVED knocking it down and (trying to) set it back up. We used it as an opportunity to talk about colors (I told the older kids about the color order of the rainbow) and size. Finally, we did some coloring. 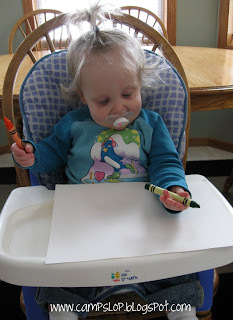 She seemed to like these crayons a lot more than the last ones we tried. I like to keep it simple with only one or two crayons (green and orange this time in keeping with our theme). I also gave her some rainbow stickers since she enjoyed them so much last time. Not sure if you can see the smile behind her pacifier in the first picture, but she was pretty excited to color! We've been having a great time with our at home activities. 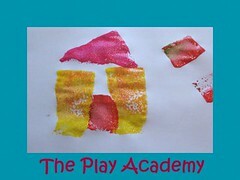 Next week we plan to join in the online art class from Pineapple Paintbrush! Hope you'll join us! Love the "catch a rainbow" experiment! 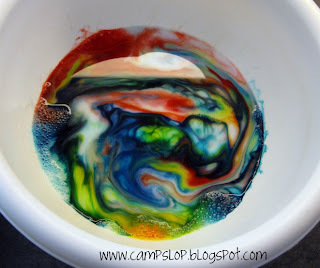 We're doing rainbows this next week and will have to try that! What a fun week and thanks for linking up. 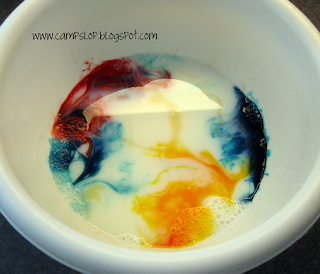 The Catch a rainbow experiment is so cool, looks like so much fun! 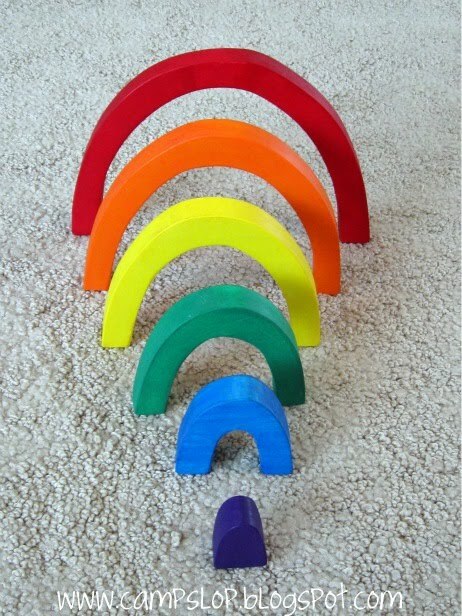 Love your rainbow stacker! I have a 33 month old and a 14 month old so it's fun to see what you are doing-- especially with the little one. Love the shaker. We'll definitely be doing that one! I also have those dollar tree coins. We use them to play store. I'll have to check out that game too! 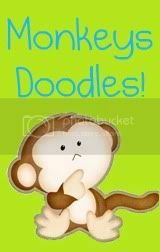 Love your cute blog!! Great Ideas!! 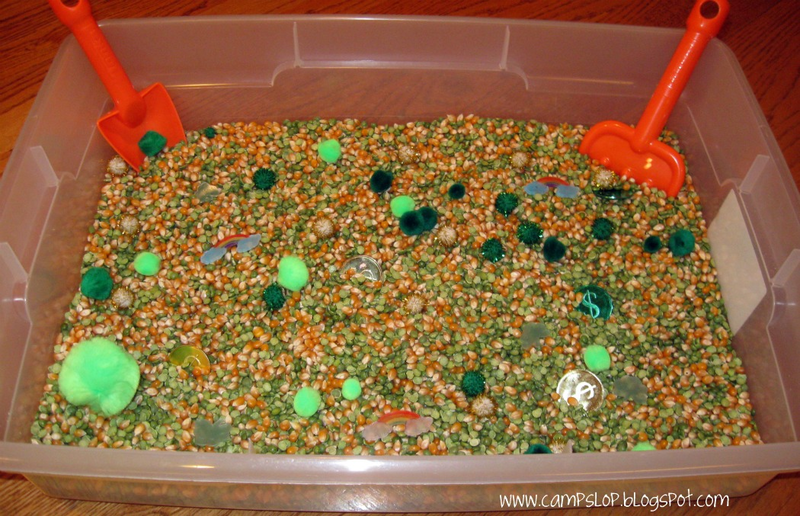 LOVE the St Patty inspired sensory bin! 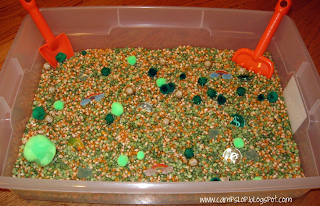 We made a sensory tub, too - I like the idea of corn kernels. Will remember that one. 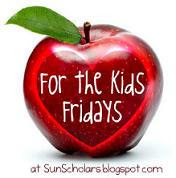 I think I'll put together the coin hunt today for the kids; looks fun! I need to look for coins next year. They looks like such fun!